If you’re into healthy eating, chances are your menu includes quinoa. 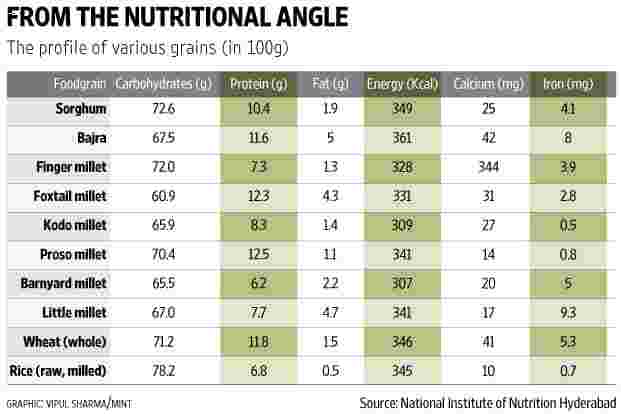 You are probably willing to spend Rs1,000 at the supermarket to buy a kilogram of the nutritious grain. But do you know that the same store stocks millets, which cost less than Rs100 a kilogram and are almost as nutritious as the Western import? Millets are coarse grains and a repository of protein, fibre, vitamins and minerals. They include jowar (sorghum), ragi (finger millet), korra (foxtail millet), arke (kodo millet), sama (little millet), bajra (pearl millet), chena/barr (proso millet) and sanwa (barnyard millet). The practice of consuming millets as part of the daily diet is not new to India. “Millets had been the major staple food in central India, southern India and hilly regions of Uttarakhand for centuries till the time of the Green Revolution. After the advent of high-yielding varieties of rice and wheat during the 1970s, millets got sidelined from our food basket," says Vilas A. Tonapi, director of the Indian Institute of Millets Research in Hyderabad. The reason for this is lack of awareness about the nutritional benefits, the not-so-sumptuous taste and the tag of “a poor man’s food". “Also, government pushed only rice and wheat in the subsidized public distribution system, rendering the cultivation of millets uneconomical," he says. Consequently, this resulted in high consumption of polished rice and refined wheat flour, which happen to be the main ingredients of foods consumed by the urban population. This trend, coupled with sedentary lifestyles, has led to a rise in obesity and other lifestyle diseases like diabetes, hypertension and heart disease, across age groups, says Divya Choudhary, chief dietitian at the Max Super Speciality Hospital in Delhi. A study published earlier this month in The New England Journal Of Medicine says India has the world’s highest number of obese children (14.4 million) after China (15.3 million). Globally, it found that over two billion children and adults suffer from health problems related to being overweight or obese. In such a scenario, gluten-free millets could prove to be an effective weapon, believes nutritionist Shubi Husain, founder and managing director, Health Sanctuary, a healthcare chain of clinics in Delhi-NCR and north India. “Children learn from their parents. If we eat healthy, they will also learn to eat healthy. Millets were part of our grandparents’ diet, it’s only in the past few decades that their consumption has reduced. We need to embrace the goodness of millets: Their high-fibre content helps in bowel movement and manages diabetes and obesity. Their high magnesium level is good for lowering blood pressure, while the potassium content keeps hypertension at bay," says Husain (see “How They Stack Up"). Research validates the goodness of millets. In 2010, a study published in the Pathophysiology journal said that eating korra could help bring down blood glucose in diabetics. The same year, a research paper published in the Journal Of Agricultural And Food Chemistry confirmed that all millets are rich sources of antioxidants, while another study in Nutrition Research concluded that millets may be useful in preventing cardiovascular disease. “In the hope of becoming fit, we start consuming whatever ‘superfood’ is trending in the West (wheatgrass, cranberries, Soba noodles, broccoli rabe, to name a few), ready to spend a bomb, and indifferent to the goodness of our own food," says Choudhary. To make millets popular across India and revive traditional food habits, Bengaluru—regarded as the millet capital—hosted a three-day Organics and Millets National Trade Fair in April. An initiative of the Karnataka government, the fair saw farmers, traders, processors and exporters taking part. Shauravi Malik, co-founder of health and organic food brand Slurrp Farm, was one of the attendees at the fair, which saw 60,000 visitors. “A stall of the state government read, ‘Let’s Millet,’ along with a tag-line, ‘Next generation smart food’, which really brought the message home. Not only are millets healthy, they are also farmer- and eco-friendly," she says. Compared to rice and wheat, millets need less water and chemicals, explains Tonapi. “Besides, some millets can come up in marginal land and harsh weather conditions where no other crop can grow. Bajra, for instance, comes up well in the hot weather of Rajasthan. Little millet, foxtail millet and barnyard millet are known to assure minimum yield even in case of failure of the monsoon. So as global warming becomes an increasingly real phenomenon, millets can actually be a smart way of farming and eating," he says. However, this doesn’t mean that you give up wheat and rice and start eating millets. “Switching completely to millets is not a good idea. We don’t recommend eating a single grain. You need to mix it up depending on your health. If you are diabetic, for instance, you can have more of ragi instead of rice or wheat. Also, since many urban dwellers are not used to eating millets, suddenly shifting to them is not the best idea," says Choudhary. You should slowly introduce any kind of millet in your diet to give some “adjusting time to your digestive system", suggests Husain. “Have it three-four times a week. You can have it as porridge, in roti or as whole grains in the form of rice or upma. Many people believe that millets shouldn’t be eaten in summer, which is not quite true. As with everything else, eating in moderation is the key (too much of millets can cause stomach ache, bloating and constipation)," says Husain, adding that you should buy unpolished millets. One reason people don’t like millets is the taste. “My mother used to force me to eat ragi mude (balls of steamed ragi, a local Karnataka dish) almost every day," says Malik. “I was not a fan, but eventually developed a taste for it. Now, I make ragi dosa every day at home and my kid loves it. It’s all about how you make it," says Malik, who struggles to make her child get used to ragi mude. The right cooking technique and a good recipe can lift any ingredient, says Arun Sundararaj, executive chef at The Taj Mahal Hotel in Delhi. “It is easy to include millets in the diet as they are very versatile. We can have millet pancakes for breakfast, millets can be prepared like rice, substituted for potatoes when cooked with gravy, and even make a great addition to bread. Millets also make a great bed for roasted vegetables and stews," he says. India was never a two-grain nation, says Malik. “Our grandparents ate all sorts of grains. We should eat everything in the right quantity, be it rice, wheat, ragi, jowar, bajra, even quinoa (if one wants to spend money)—because each one brings its share of goodness. The key to eating right lies in food diversity, not becoming a victim of a food fad." Mix ‘ragi’ and wholewheat flour and salt in a bowl. Add banana, eggs, vanilla extract, honey and milk. Heat a non-stick pan brushed with oil. Pour a ladle full of batter in the pan and cook on low heat until slightly set. Flip and cook on the other side. Top with banana slices, almonds and honey. Serve warm. Toss the ‘bajra’ to remove husk. Wash, drain and pound. Mix ‘bajra’ and ‘moong dal’ with enough water and pressure-cook till it’s tender (around four whistles). Heat ‘ghee’, add cumin, asafoetida, coriander powder, garam masala and chilli powder. When the cumin splutters, add the ‘bajra’ mixture, simmer for 2-3 minutes and serve. Heat 2½ cups of water in a pan. Mix the millet flour in the remaining ½ cup of water. Make sure there are no lumps in the mixture. Once the water comes to a boil, slowly add the millet mixture. Cook for 2-3 minutes, stirring continuously. Remove the pan from heat and let this mixture cool. Slowly add the cooled millet mixture to buttermilk and whisk well. Add salt, roasted cumin powder, asafoetida, curry leaves and onion and mix well. Chill for a few hours before serving. Garnish with fresh coriander.